Our bandages are ideal for minor cuts, abrasions and puncture wounds. Each bandage is ventilated to aid in the natural healing process. They effectively protect scrapes and cuts while the non-stick pad absorbs drainage. These are the bandages you will always want to have on hand whether that be in your classroom, home, office, or car. Latex free. A mix of 150: Contains 125 plastic and 25 fabric bandages. The 50 person, large plastic SmartCompliance ANSI A+ cabinet with over the counter medications is perfect for a school or a large classroom setting. The unique cabinet design eliminates disorganized and missing supplies, while the clearly labeled compartments create a cabinet that is easy to use and restock. The expansion pocket allows you to customize your cabinet to meet your specific needs. 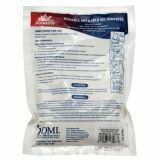 Triangular Bandage, 40" x 40" x 56"
Cold Pack, 4" x 5"
Burn Dressing, 4" x 4"
The reusable hot or cold medium gel pack measures 4-1/2' x 6-3/4' and features long-lasting outer plastic bag that lasts for years. This reusable gel pack has active ingredients of propylene glycol and sodium carboxymethyl cellulose. 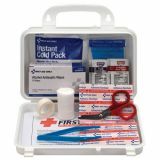 This first aid bulk kit is perfect for your classroom or field trips. Includes all the basic necessities you may need in case of a minor accident. 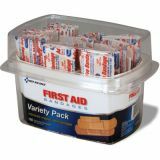 This is your basic first aid kit that has bandages, ointment and what you may need for minor cuts and scrapes. 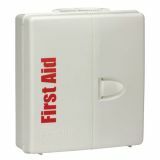 It is an ideal kit to have for those minor first aid incidents. 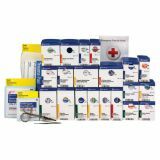 113-piece kit includes alcohol pads, antibiotic ointment, bandages, first aid cream, instant cold pack, scissors, tape, tweezers, gloves and a first aid guide.